The highest point of County Meath is an absolute must on the MV list, especially so for history lovers. The views on offer are truly expansive, but it is the significance of the landscape that provides added interest. Clusters of megalithic cairns are situated at Slieve na Calliagh and surrounding hills in the North Midlands, comprising one of the largest prehistoric burial grounds in Ireland. The presence of so many cairns invests this landscape with power and spirituality. Unsurprisingly, these high and holy places have drawn people to them for eons. Queen Maeve was reputed to have sat on the Hag’s Chair, one of the large rocks of the cairn atop Slieve na Calliagh, to proclaim the law of the land. More recently Catholics held mass here in secret, denoted by a cross carved into the rock surface. The Rev. Eugene Conwell was the first person to seriously study the cairns of Loughcrew in 1863, and it was he who ascribed to them the various letters that are still in use today. Cairn T or Hag's Cairn atop Slieve na Calliagh, is a classic example of a Passage Tomb similar in design to Newgrange, comprising a cruciform underground chamber with a corbelled roof topped by an enormous cairn 35 metres in diameter. A richly decorated backstone reveals that the Cairn has a clear astronomical purpose. The illumination of the passage and chamber at the winter solstice sunrise in Newgrange is world famous, but less well known is the equinox illumination at dawn in Cairn T. Over the course of about 50 minutes, a beam of sunlight shaped by the stones of the entrance slowly creeps up the passage towards the backstone, moving from left to right illuminating solar symbols. A pleasant 10-15 minute walk up a grassy hill from a small car park brings visitors to the passage tomb. 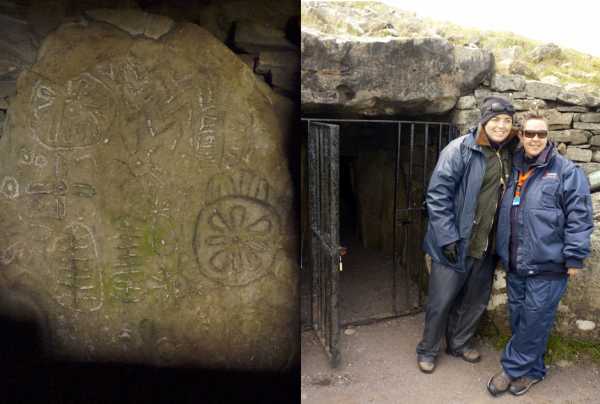 If you ensure that your visit takes place during June to August the passage tomb is open and there are OPW guides on site who accompany visitors inside and explain the history and significance of the site and its artwork. At other times the tomb is locked, but it is possible to obtain access by collecting a key at nearby Loughcrew Gardens.